Articles by SPIB authors on most of Governor Palin’s appearances can be found by keyword using the Search function in the Archives section of the right sidebar. Links to several thousand articles are posted by category in the Sarah Palin News Links subpages, which include those listed below. You can search any SPIB page by keyword using the browser Edit/Find function. 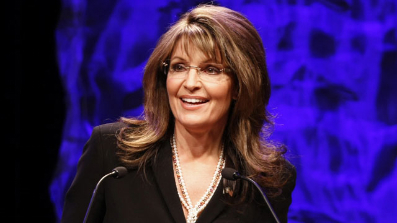 Also see Latest Palin News for links to articles about more recent Palin events. Sarah Palin came to Georgia in true Palin style…and I was there! I wanted you to know that I’ve been praying for you. I’m sure right now, you are facing a decision of a lifetime whether to run for the office of the President or not. Maybe you have already made that decision with your family and have not as yet shared it with the American people. I also felt that I should share with you something that may seem a little silly but had some significance to me while I was bringing you and your family before the Lord. I am a homemaker/ teacher who has started empty nesting with just my youngest still at home going to college. I’m learning to make those adjustments after having home educated my three boys for these past 26 years. It had to be well over a year ago, while I was cleaning house and rearranging furniture that I came across this great idea. I have had this old dresser for quite a while and have lugged it all around with me throughout the years of our moving and whatnot. It is one of those rare garage sale finds that only cost me $5.00. Though I have placed it here and there and tried to figure out where it would best fit in my home, I have never quite been able to find an adequate place for this dresser. As hard as I have tried, however, I can’t bring myself to get rid of it. I have just loved this scarred up, old dresser that a little Old English oil makes a bit of difference on. It has precious, sentimental value to me. I don’t know whether its value for me came from the idea that somebody didn’t care for it much and it needed some tender loving care or that it was such a great find at a time when my budget was low and I needed to feel that I could still have something valuable because I was just that special to someone else. One day as I was cleaning, I had this bright idea to take this dresser into my kitchen and see if somehow it would blend with my cabinets and make a good kitchen island. My kitchen is a bit too wide and needed something right in the middle to make it all come together and give me an added workspace between the stove and the sink, etc. When I wheeled the dresser in the middle of the kitchen to see how it would look, well it left a lot to be desired. For one thing the color was completely off. The dresser was really dark and all my kitchen cabinets are really different being a much lighter color. Then the dresser doesn’t look like a cabinet. It has a back on it with three drawers on the front and so I started thinking of how I could make it look like the island I wanted. I could add shelves to the back of it to widen it and maybe on the ends I could extend it and put wooden pillars and corbels with trim to fancy it up to where it would look like some of the other islands I had looked at online and in magazines. I would probably have to completely broaden the base of it and maybe put wheels on it to add all that other stuff to it. Then of course it would have to have a whole new top. Maybe I could even get some granite to go on top to blend in with my counter tops. All in all, it would take a lot of work and effort to make it blend in and fit into my kitchen. My husband even got in on the planning and dreaming about changing that dresser into an island and started talking about how he could make the changes to make it part of the kitchen. I knew that the other cabinets would always look different. I figured I would just paint it after completing all the changes to it. I kept the dresser in the middle of my kitchen during the Thanksgiving holiday just to see how it would fit in and then after a while, I decided to paint it and put it somewhere else. Your cabinet around you would look completely different than you. None of them would be the same, think the same, feel the same or even look the same. And even though you could be strengthened with beautiful pillars and beautified with corbels and expensive trim along with paint to change your appearance, to make you try to fit in, hopefully, you would still be the same. You might be wiser and stronger and prettier and even built to fit in the kitchen better because of the changes they would want to make in you, but you will still be that highly cherished, deeply loved, flawed, not perfect dresser in the middle of that kitchen. I could see the contrast and the difference. I really had no idea whether this was a good thing or a bad thing. I just felt that your job as President would be a very hard thing to do and that it would take a lot of work! I even asked the Lord, “Is she supposed to join that group, The Kitchen Cabinet?’ It is a Conservative women’s group I saw online who are “striving to protect the economic futures of our families and who desire to have a stronger voice in Washington.” Since so much of what I was doing and seeing had to do with kitchen cabinets!! I didn’t know if you had heard of it. I wasn’t sure in seeing this analogy, what the outcome was supposed to be. All I have known was that I should be praying for you that the Lord would guide you in your decision. Whatever that might be. I just felt that I should share this silly story with you and I want you to know, that you are and will always be deeply loved and highly valued. That’s your inalienable right given to you by your Father! By the way, when I moved the dresser from the bedroom to the kitchen for the first time, there was an old faded Uhaul sticker on the back of it that I had never noticed. Written on it was the name, Palen. Spelled with an “e”. It took me a while to get over that one! I guessed that was how much the Lord wanted me praying for you!